Castleford have moved up to third in the Super League table with a strong win over Warrington. The result sees the Tigers move into third on 33 points, while the Wolves are in fourth on 31 points. Castleford coach Daryl Powell made three changes to his side that lost at Wigan Warriors last week. Peter Mata’utia, Grant Millington and Calum Turner came in for Adam Milner, Jesse Sene-Lefao and Kieran Gill. Steve Price also made three changes to his Warrington outfit that beat Catalans Dragons last time out. Stefan Ratchford, Mike Cooper and Ben Pomeroy replaced Josh Charnley, Ben Westwood and Harvey Livett. Castleford got off to a great start at the Mend-A-Hose Jungle. Mata’utia threw a fine cut-out pass to James Clare who had plenty of space to score in the corner. Jamie Ellis failed to convert, but they were 4-0 up. Warrington forward Cooper was penalised for a high tackle on Nathan Massey in the 14thminute. Castleford opted to take a shot at goal and Ellis added the penalty goal to edge his side into a 6-0 lead. The visitors were dealt a huge blow midway through the first half. Mitch Brown collided with Jake Webster and the winger left the field with a dislocated knee and didn’t return. Castleford extended their lead through Junior Moors. The Samoa international latched onto a grubber from Paul McShane to touch down. Ellis added the extras. McShane was outstanding for Castleford in the first half. He was constantly organising moves and he came up with a couple of nice attacking plays. Greg Eden scored for the Tigers on the brink of the half-time hooter sounding. He made an intercept and raced 40 metres to dive over in the corner and give the hosts a 16-0 advantage at the break. Warrington started the second half in good spirits as Ratchford raced onto a Kevin Brown kick to score. He converted his own try. The Wolves scored their second just seven minutes into the second half. Kevin Brown threw a quick cut-out pass to Bryson Goodwin who went through a gap to score. Ratchford converted and they were only 16-12 behind. Castleford started to get back into the game in the final quarter and settled their nerves with a try. Eden grabbed his second of the game as he got on the end of a McShane kick to go over. Ellis’ boot took the score to 22-12 after an hour. Mike McMeeken ran a superb line to step Ratchford and score in the 66thminute and that was the game-breaking moment. Warrington scored what would only be a consolation late on through Ratchford, but Castleford claimed a 28-18 victory to move above Warrington in the Super League ladder. Castleford: Mata’utia; Clare, Webster, Shenton, Eden; Ellis, Trueman; Watts, McShane, Millington, Wardle, McMeeken, Massey. Subs: Moors, Holmes, Clark, Turner. Warrington: Ratchford; Lineham, T King, Goodwin, M Brown; K Brown, Roberts; Hill, Clark, Cooper, Thompson, Hughes, G King. Subs: Patton, Akauola, Philbin, Pomeroy. 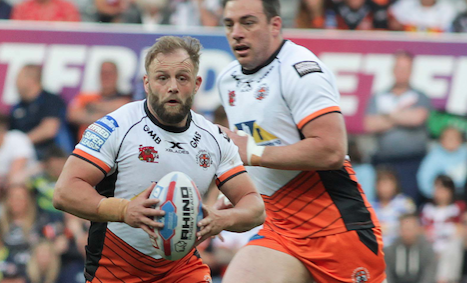 Starman: Paul McShane was fantastic for Castleford throughout the game. He came up with some great attacks and his kicking game was on point.